You'll be £25.00 closer to your next £10.00 credit when you purchase C-130 Hercules. What's this? Designed in response to a 1951 requirement, the C-130 Hercules is the most successful military airlifter ever built. Since it first flew in prototype form on 23 August 1954, more than 2,100 have been produced in over eighty different versions. Across its variants, the Hercules serves more than sixty air forces, as well as many civilian cargo operators, in a multiplicity of roles, including air-to-air refueller, gunship, airborne command post, flying hospital and fire-fighter. This rugged and easily maintained aircraft entered service in 1956 with the USAF Tactical Air Command. Ten years later the 'Charlie 130' was providing the essential logistical support in Vietnam. This period in South-East Asia was the Hercules' finest hour. Paradrops, airlift and evacuation operations were completed around the clock, often at low level, usually under fire and nearly always in bad weather. A generation later this 'Mr Dependable' was serving with equal distinction in the Gulf War in the role of airlifter, radio-countermeasures and 'psy-ops' platform, gunship and, once again, 'block-buster bomber'. The 'Herky Bird' or 'Fat Albert', as the C-130 is fondly known, has proved a key component in humanitarian relief operations ever since, in all parts of the world. 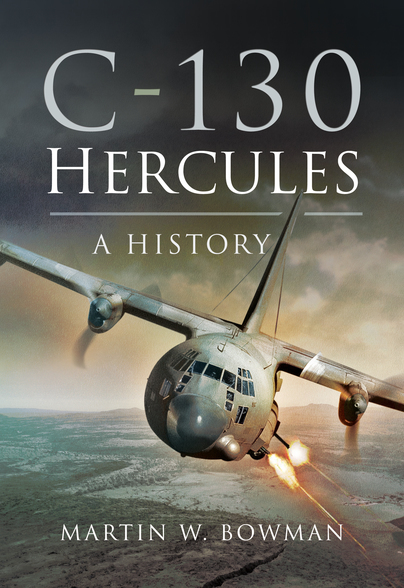 The incredible success story of the C-130 is far from over. Here Martin W. Bowman tells the full story of this remarkable aircraft at first-hand. Martin Bowman has managed to collect a stunning selection of images to support each chapter, which really brings the book to life. The anecdotes and stories are also well researched and give the book a lot of authority. Bowman certainly captures the excitement of one of the more successful military aircraft of all time. ... this book is an invaluable reference on one of history's most significant transports. A welcome new book on 'Fat Albert' probably the most successful military airlifter ever built. The interesting text is accompanied by over 250 photographs. A history of an aviation great, from the pen of a popular and well-established author of aviation history. This new book contains a great many outstanding images, mostly in full colour through the body of the book. As always the author has impeccably researched his subject – Much Recommended. ★★★★★ This, quite exceptional book by Martin Bowman provides all those with an interest in the complete history of the aircraft as we learn of those early days, ongoing developments and the various roles undertaken. These include; airborne assault, military transport, in-flight refueling, civil aircraft, flying hospital, humanitarian roles, fire-fighting tankers and even gunships (to name some!). It is a richly illustrated book with plenty of colour and B&W images on the majority of pages. These include a wide cross-section of exactly what the reader will expect to find and do much to support a story that is well-told throughout. Altogether, it is an excellent product and one which will stand the test of time – although we are also informed it is a story which is not yet over! We regularly have squadrons of Hercules flying over North Norfolk, sometimes I even manage to get some shots if they're overhead whilst I'm out with Skipper the dog and have my camera with me - these majestic aircraft are a sight for sore eyes, and Martin's technical and informative look at their creation and use is absolutely fascinating. An iconic aircraft gets Martin's VIP treatment in this wonderful book. A very interesting and well written book on an aviation legend.